The word "tifter" is British slang for a gentleman’s hat (hence the label) but this beer is about as un-British as they come. The most bitter of the three core beers, Tifter is a “3C” hoppy American amber ale. The “3C” refers to the three American hops used – Centennial, Chinook and Cascade – all of which are either added late in the boil or via dry-hopping in the tank. The result is a rather bitter beer, yet with beautiful floral and citrus flavours. In order to balance things out, an array of caramel malts are used, resulting a brilliant dark amber colour. It also provides a chewy toffee character whose sweetness helps overcome any harshness from the hops. 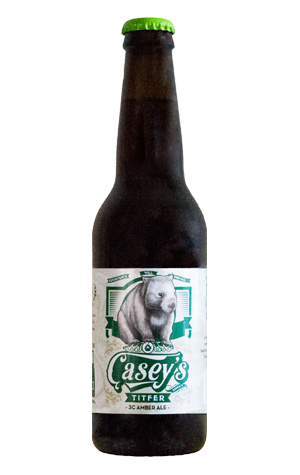 In a similar vein to the rest of Casey’s beers, it comes as a pleasant surprise that the ABV is still low enough that more than one of these flavourful gems can be enjoyed in a session without too much of a wobble.